Kids can practice listening to Spanish with this short description of a common food. They try to guess the word being described. This is one of a series of videos called Adivina la palabra de hoy (Guess Today’s Word). The series is produced by a private non-profit from Spain that promotes the teaching of Spanish, the Fundación de la Lengua Española. In this video, two children describe a common noun, and at the end, the word appears on the screen. The video is short, about one minute long. Adivina la palabra de hoy is great Spanish listening practice. The sentences are short and the children speak clearly. There is no distracting background noise on the video. Children will not understand every word of the description, but that is normal. They are practicing listening for the main idea, that is, how the words that they do understand come together to communicate one concept. This is an important skill in language learning. Children need the opportunity to practice in order to develop the ability to distinguish the words they know. These videos are also a good way to learn new words. The words in the descriptions are often used together and are associated with the word you are trying to guess. This is an effective way to expand vocabulary in combination with Spanish listening practice. Below are some of the most common words used in the video. Listen for them with your child and try to guess what is being described. The mystery word will be shown at the end of the video, but if you want to know before you listen, scroll down. A transcript, translation and the answer follow the video. Se prepara en la cocina. / You make it in the kitchen. Se suele tomar caliente. / It is usually eaten hot. Se toma con una cuchara. / You eat it with a spoon. Se come en un bol. / You eat it in a bowl. O fría. / Or cold. La hay de varios tipos. / There are various kinds of it. Es de distintos sabores. / It is different flavors. Puede ser de cualquier cosa. / It can be made of anything. Y la más normal lleva fideos. / And the most normal kind has noodles. The word being described is sopa – soup. There are many other Adivina la palabra videos, and they are all excellent Spanish listening practice. 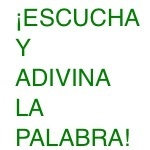 I have written about several others that you can find by searching “Adivina la palabra” here on Spanish Playground. For the entire set, do the same search on YouTube. Some of the videos are more difficult than others, but they all include some vocabulary that Spanish language learners will understand. You will find videos describing words such as pez, cara, chocolate, cuello, muñeco, teléfono, perro, cerdo, silla, mar, azucar, zapatos, abuelo, plato, cocina, gordo and terraza.